IS ATTIC VENTILATION REALLY THAT IMPORTANT? All of these are issues that can cost you more money than necessary, but there are solutions and AJ Construction can help. Is an Attic Fan Installation Necessary? By simply installing an attic fan, you can avoid these problems and keep your home and roof healthy. AJ construction offers attic fan installation that is high quality at a great cost. 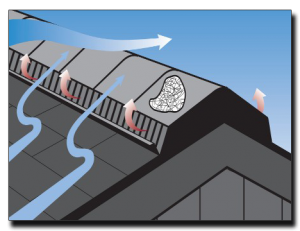 Our soffit vent system is designed to work in conjunction with under-eave soffit ventilation. If your home lacks soffit ventilation or the soffit area is non-venting, you will want to have a qualified contractor install some type of soffit vent. Be aware that some roof ventilation configurations may require special consideration and recommendations to perform properly. AJ Construction uses only the finest products in the industry and we always recommend Air Vent products when looking to install an air ridge vent. Another great option would be attic fans. If you are considering a power roof mounted attic fan, we strongly recommend selecting one that comes equipped with a humidistat such as the Power Cool Plus by Air Vent. With Air Vent products and AJ Construction, you can rest assured that your ridge vent and attic fan installation will be strong and dependable. Watch your energy bills drop and keep your roof healthy with a new soffit vent and attic fan. If you’re in need of an attic fan installation, don’t hesitate to call us today! We offer free estimates and evaluations so give us a call right away!